This is a sponsored post. I received LISTERINE® Brand products from Johnson & Johnson Consumer Inc. and Socialstars as part of my participation in this project. All thoughts and opinions expressed in this post are my own. I love blogging! (Did you know that Oh So Savvy Mom turned 5 years old this summer?!) One of the things I love about blogging is that, as an introvert, I can interact with people at my own pace, in a quiet and subdued way. 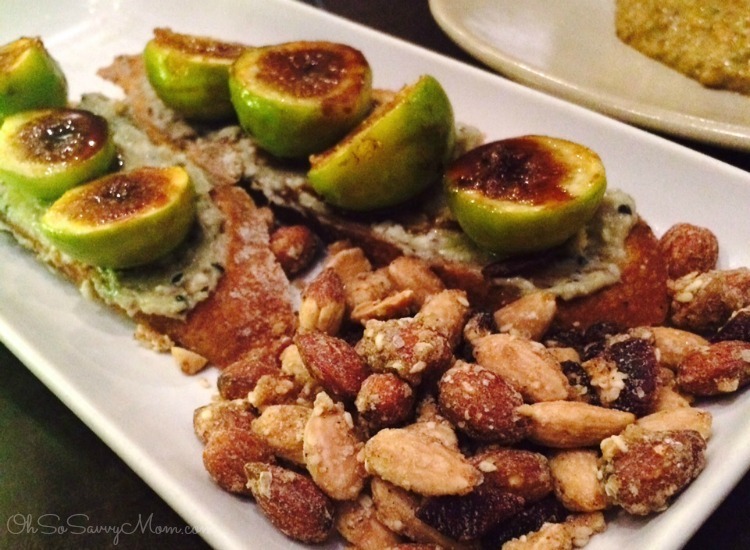 This last month I had the awesome opportunity to attend two amazing blogging events. At the end of April I went to a wonderful blog conference where I met so many great people. I’m an introvert and a recovering shy person (I was painfully shy as a kid, but have since shaken off most of that shyness) so attending a blog conference where I knew a big fat zero people there was a big step out of my comfort zone. Despite not knowing anyone, I made some awesome friends! Here I am with Cynthia from Life by Cynthia and Lora from Lora Says So. A few days after that I headed to Seattle, Washington to meet up with a brand that I am an ambassador for. I met some amazing bloggers and representatives from the brand. The event was centered around food, and I may have always been trying to ascertain if my breath was deadly or if I had anything in my teeth. Over the course of my life I’ve learned some things that have helped me not only overcome my shyness and social anxiety, but also helped me, as an introvert, cope with large social situations. 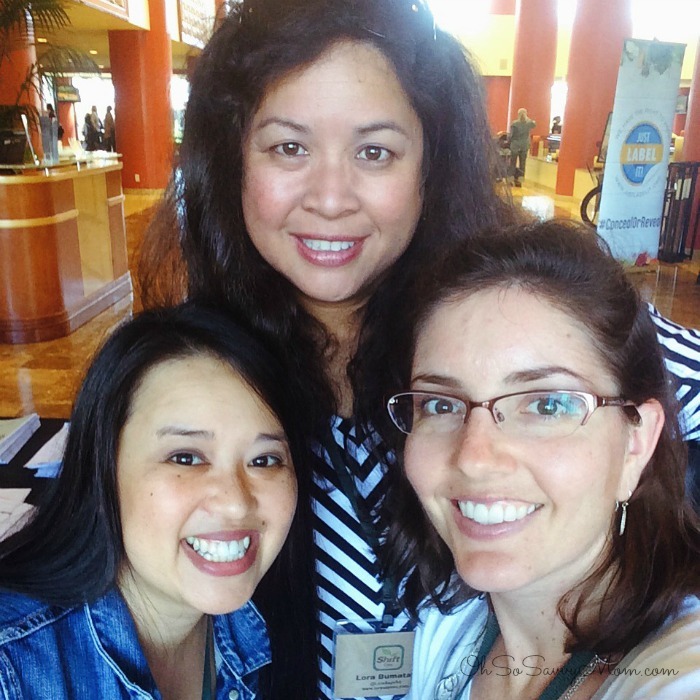 In the blogging business, just as in any business, it is important to attend conferences, meet others and network. It is okay to be an introvert. There is nothing wrong with being introverted. Like extroversion it is simply a component of your personality. It is also important to note that introversion is not the same as shyness. While some introverts may be shy, not all introverts has the social anxiety component shyness brings. Prioritize time to be alone to recharge before and after social events so you can be at your best when you are in social setting and recharge afterwards. Let people drag you places you don’t necessarily feel like going. Chances are you’ll have a wonderful time once you get there and begin interacting with people. Get out of your comfort zone occasionally. You’ll make new friends and have some great experiences. When at events with a large numbers of people, seek out smaller groups. You’ll be more at ease and won’t feel physically and emotionally drained afterwards. If you tend to be a shy introvert, seek out a group with one or two people you already know and can converse easily with. Your friend will introduce you to new acquaintances and pave your way into the conversation. Realize and accept that small talk is a cultural norm and the way most people begin conversations with people they are just meeting. In general small talk bores and exhausts introverts, but when attending a business event a fair amount of small talk is inevitable. Arrive early. In an effort to avoid some of the socializing time, introverts (like me) tend to arrive late. While it may sound a little counterintuitive, it is actually better to arrive early. You can help out the host by doing that not only make a really good impression, but you’ll meet a lot of great people that you may not have otherwise met. Finally, plan ahead to make a good impression. More than 7 in 10 Americans believe having an unhealthy mouth can negatively impact a person’s confidence giving a speech (75%), and more than 6 in 10 believe it can affect a person’s willingness to speak in a meeting (64%) and their ability to lead a meeting (61%). While you may not have speaking engagement, a good amount of any given person’s time at social events is spent wondering “does my breath stink?” “I hope none of that cilantro got stuck in my teeth!”. I’ve carried around Listerine® Pocketpaks® with me since all the way back in college. They are an easy and inconspicuous way to make sure you’re always making a fresh impression–and they are a heck of a lot more convenient than carrying a toothbrush and toothpaste around in your pocket! 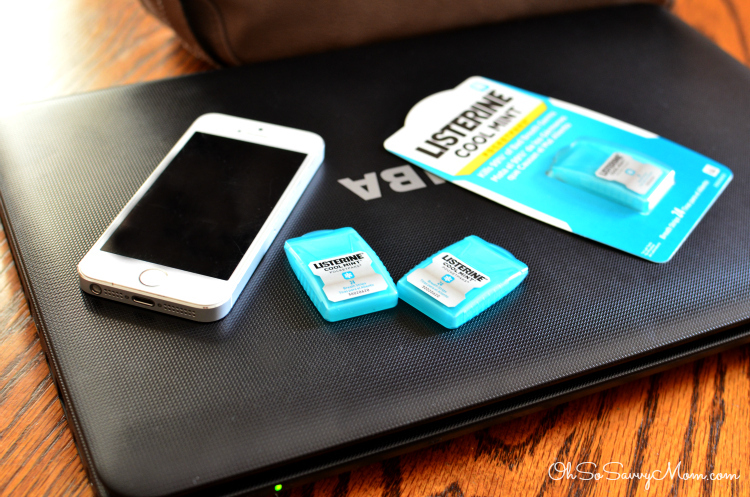 The Listerine® Pocketpaks® are the perfect on-the-go oral care solution! They are so tiny they fit easily in any pocket. 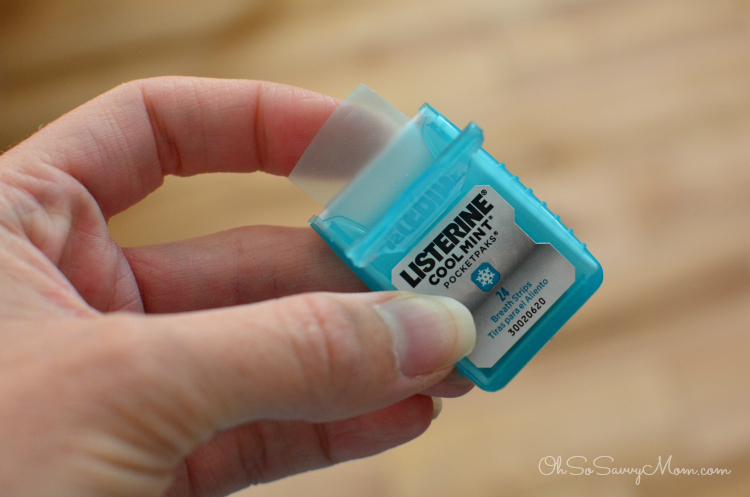 These thin little Listerine® portable Pocketpak® strips are pretty impressive. Each strip dissolves instantly in your mouth to kill about 99% of bad breath germs. Your breath will be fresh and you won’t be left wondering if perhaps you should have laid off the pickled garlic. Because brushing alone can miss up to 75% of your mouth, incorporating a therapeutic mouthwash is vital to your oral care routine. Rinsing with Listerine® provides 21% greater gingivitis reduction and 52% more plaque reduction than brushing and flossing alone. Given the stats it sounds like pretty much everyone could benefit from a better oral care routine including rinsing with a therapeutic mouthwash like Listerine®. I’ve recently started using mouthwash regularly and I love how much cleaner my mouth and teeth look and feel! Take the challenge and rinse once a day! To find out more about LISTERINE® Brand products, visit www.listerine.com. Next PostParents: Sharpen Your Pencils, Here are Some Education Tools Just for You! 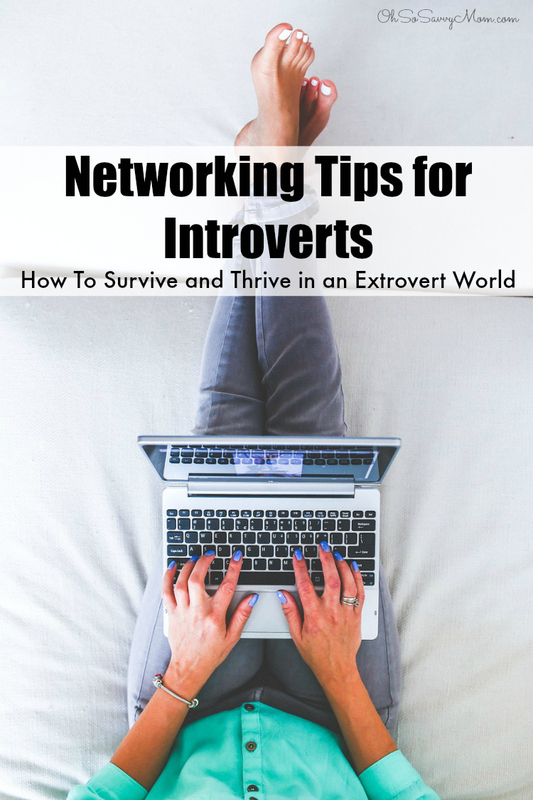 Those are great tips from a fellow introvert. I am an introvert too and like you, was painfully shy growing up. I was a mess. I do not consider myself shy anymore but most definitely an introvert. Love your tips. These are some great tips for sure! I can most relate to #3 about letting others drag me to places that I don't really feel like going to. I almost always end up having a fun time once I'm there! I also like the tip about arriving early so you'll have more time to socialize and make a good impression. Amy, I witness you transform from introvert to extrovert in a matter of hours!!! I'm kinda that chameleon too, depends on my mood and the event I'm at. I hope you're doing well!